Hey guys, Katie here! Are you all ready for the 4th of July? My favorite part about the holiday is definitely the fireworks! I created this album based on last year to hold 4th of July photos, but I never finished embellishing it, so it's about time, right? I used Helmar Zapdots to create those ombre glitter dots on my album! Today I though I'd show you how. 1. Peel the zapdot off the package backing and apply it onto your paper, peel off the front piece. 2. Take 1 color of glitter and sprinkle a small bit on to the top half of your zapdot. Shake the excess off, careful not to knock it onto the other half of your dot. 3. Take a 2nd color of glitter and sprinkle it onto the still sticky piece of your zapdot. Shake off any excess and you have a multiple colored glitter 3d dot! The perfect embellishment! Crafting is my guilty pleasure. Therefore I'm often found at my craft desk during nap time or after everyone is in bed. I don't often get crafty during the day and because of this I haven't often included my little guy into anything that might get messy. He is one kid that I could totally see trying to paint the new sofa or some such nonsense and I really don't need to put any ideas into his head. I might need to change that train of thought since this project was a big hit and he loved painting. I started off with a stretched canvas. The canvas wasn't treated and so I decided to coat the whole thing with a coat of Helmar Decoupage and Craft Paste. It provided a nice base to my project so the paint and glue didn't seep into the fabric. Once dry (with a little assistance from my blow dryer) I set up a little area on the kitchen table for Thomas to paint the whole canvas with silver metallic acrylic paint. Once all that paint was dry I had him help leave his mark on the canvas in glue. I coated his little hands with Helmar Tacky Craft Glue - using a pretty thick layer. Once the glue had dried I went back over the raised glue areas with some gold metallic rubons (the same ones I used for my faux metal letters earlier this month). The impression of his little hands really popped out from the silver background. I finished the corner off with a wood veneer letter T (adhered with some Helmar 450 Quick Dry Adhesive) and the date. I'll definitely be finding more paint/art projects for the little guy to do and this little canvas is now hanging on my bedroom wall. One of the many wall decor projects I have in mind for over the bed. Thanks for stopping by the Helmar blog today. Don't forget to find some crafty time with your little ones and Happy Crafting! 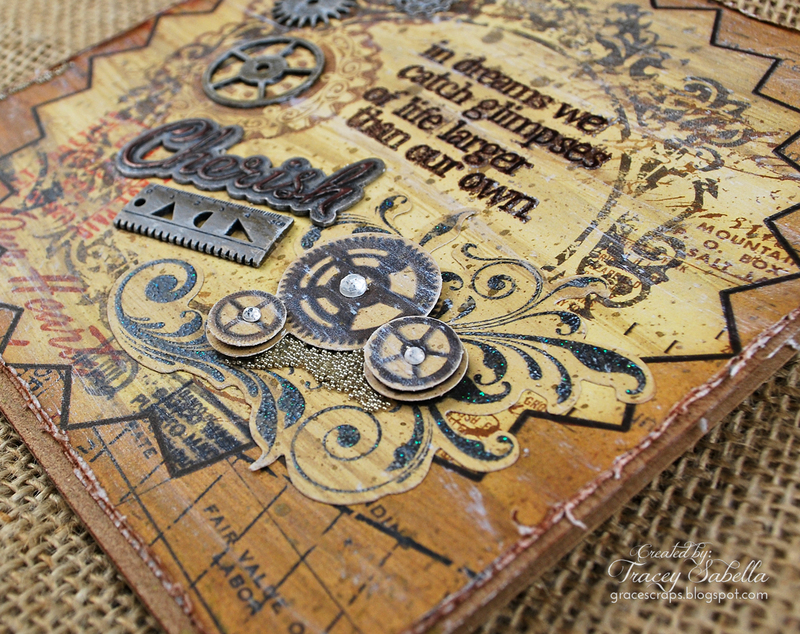 I'm a big fan of Helmar's Liquid Scrap Dots! Hi everyone, Sandee here to share a fun 3-D project with you today! This is a commissioned piece for a baseball fanatic who came into the gallery asking where to go to get a picture cut and popped up so he could frame it. The owner of the gallery immediately called me because I am always going on and on about the wonderful glue products that Helmar makes!! He gave me 2 8x10" photos, wanting the original one to be cut and placed on top of the copy. The next step was applying a thick layer of Helmar's Liquid Scrap Dots to the backside of the photo which is ideal for intricate work and all raised effects. Knowing that it's acid free sets your mind at ease that the original photo will not be harmed. Then you lay your cut out piece directly on top of the whole picture, gently press down to make sure you have good contact and let it cure before handling. 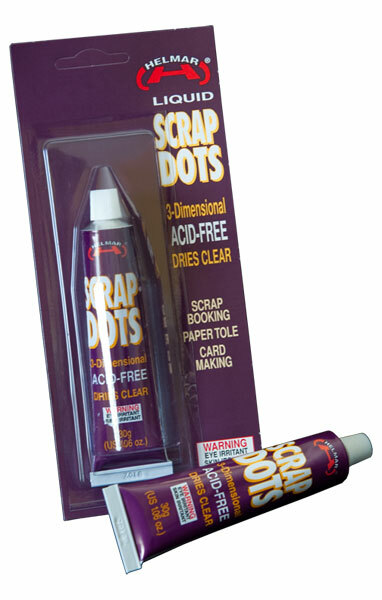 Adding little details will make all the difference and Helmar's Liquid Scrap Dots always rises to the occasion because you can alter the different heights by the amount of adhesive you use. Here, in the corner of the picture, I raised the table a little higher to bring it out. I cut my fabric then I tore the rest to get a fun fringe around the fabric. You can cut your fabric to length or leave some hang over the edge so you can make waves in your "stripes" then just glue them around on the back. I added some buttons in between and the other's added stars and more! Hi everyone Monica here with a Helmar post for you today. I am sharing a layout I did and this is a rarity since I dont do these too often, but I think its time for me to brush up on my layout skills. I created this one using a picture of these cheetah or hmm... may be a leopard or something. Anyways it was at the zoo and when I saw the picture and paper they just seemed to match. I used Helmar Super-Tac to lay down the chipboard pieces to make sure they would not be going any where. This glue is so great it dries in seconds and for me that is a good thing. I also used the Helmar Crystal Kote Fixative spray over the chipboard pieces as a topcoat for the ink because ink always seems to rub off and I am sure it is something I am doing I know. 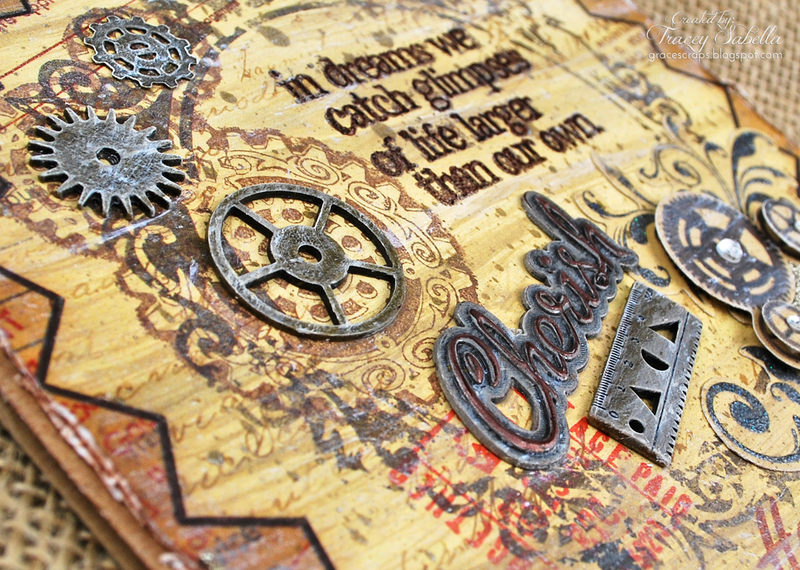 I used my Helmar Liquid Scrapdots on the back of my chipboard word frame below to have it pop off the page more and to give it a 3d look. Now this is some awesome stuff!! Hi everyone! It's Tracey here today to share two Father's Day cards I created for very special men in my life. I hope you've had a wonderful week and had an opportunity last weekend to celebrate with the special fathers in your life. Over the course of my paper crafting journey, I've attempted a variety of methods for adhering my paper layers together. Even though my style leans toward grungy mixed media, I like things to be lined up nicely. I've discovered that Helmar Premium Craft glue works perfectly to adhere my paper layers together by allowing time to adjust and position without warping the paper. This first card is one I crafted for my father. 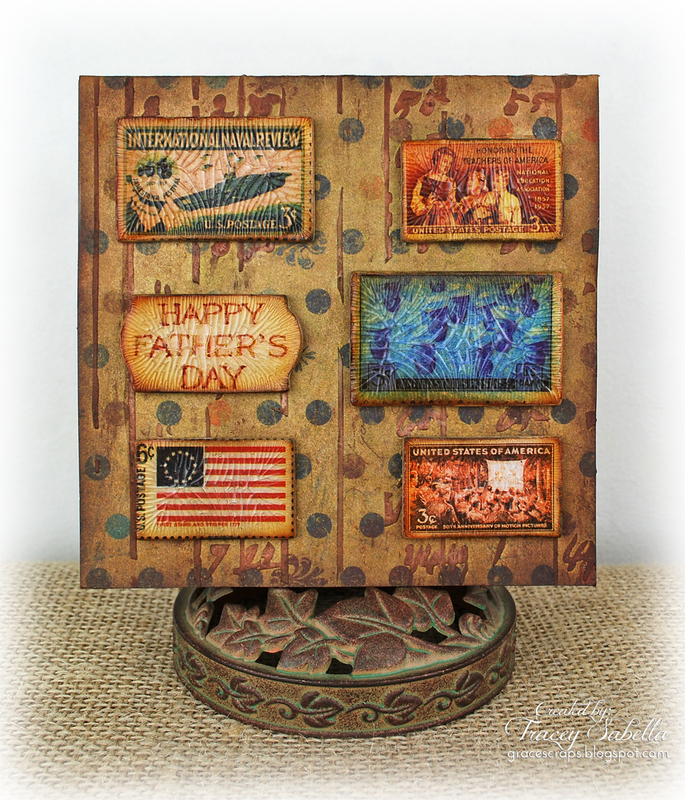 My father is an Air Force veteran and was thrilled with this vintage patriotic themed card. I cut my patterned paper to size then applied Helmar Premium Craft Glue around the edges swirling some across the center. When I flip the paper over to adhere to the card base, I use my fingers or a brayer to press out the glue out into a thin layer. Notice that I did not apply the glue too close to the edge, so when it spreads, it won't ooze out. You can see how nicely the layers line up with the card base. 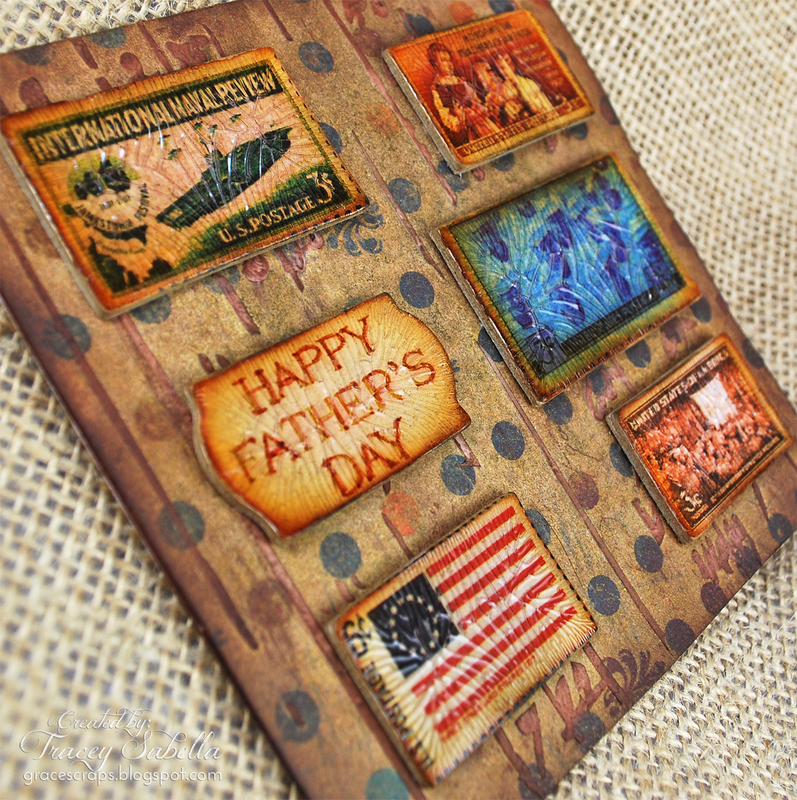 I applied a clear crackle medium to these vintage flag chipboard pieces. Although these flags were chipboard "stickers", I find that the tackiness on the back does not adhere as permanently as I would like, so I peeled the sticky portion off and adhered with Helmar 450 Quick Dry Adhesive instead. 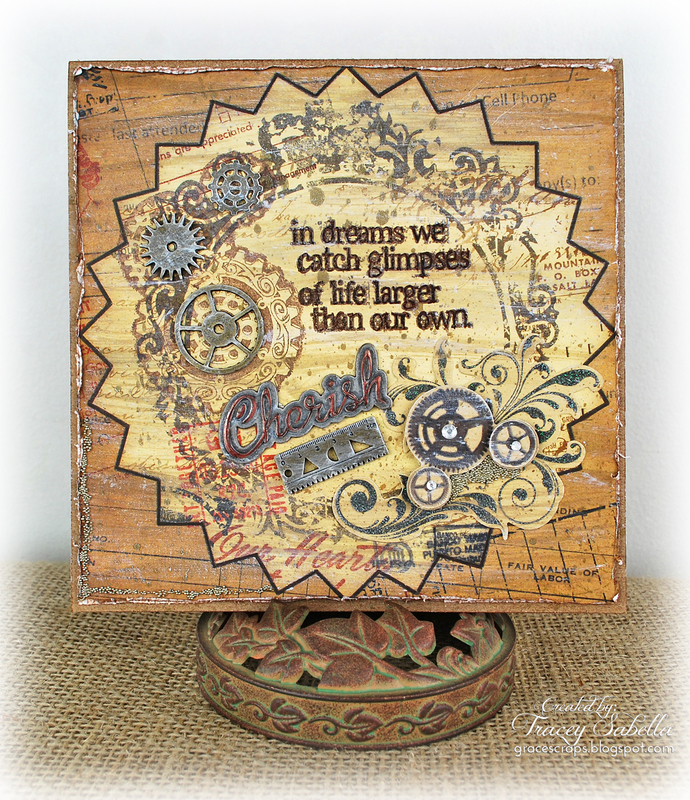 The background was aged by applying molding paste using a ledger stencil. I then applied pan pastels to color and age. To seal the Pan Pastels, I spritzed with Helmar Crystal Kote Fixative Spray. This is the card I created for my wonderful husband. 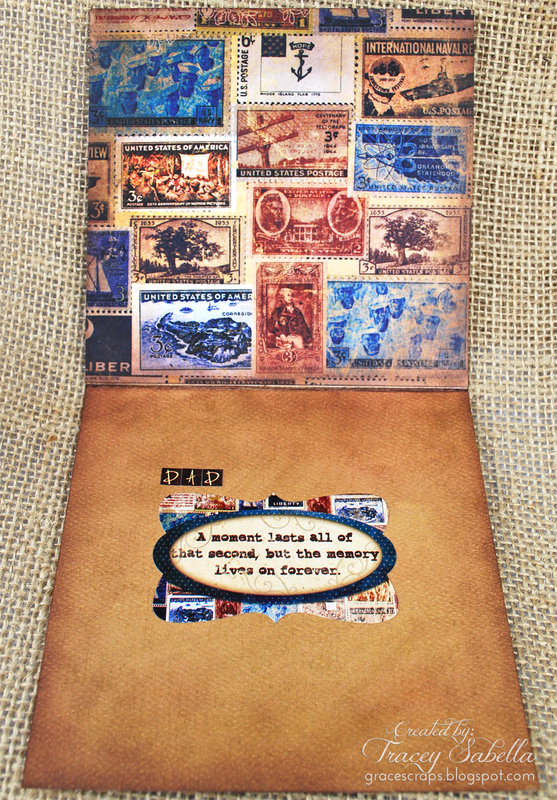 Although the background was already printed, I've added additional stamping and heat embossed the sentiment. You can see that I've used several layers for the inside of this card, adhering the paper and chipboard as described for the previous card. 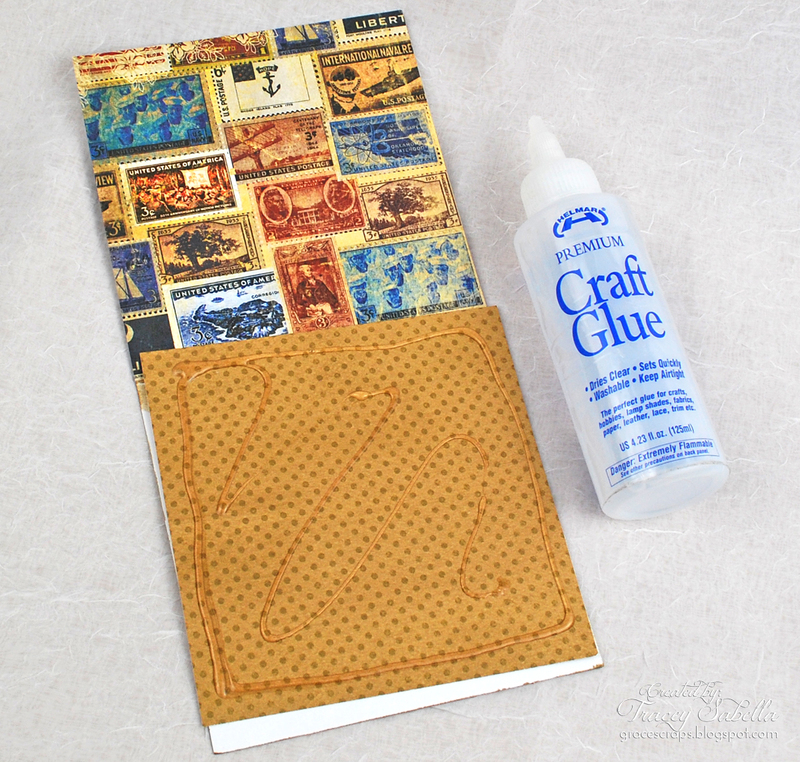 I hope you'll try out Helmar Premium Craft Glue in your layered paper projects! Hello there, and happy mid week to you! Today I have a quick, easy, and fun layout to share with you. Besides the picture, the multiple textures on this LO makes me so very happy. What makes me happier is how well Helmar adhesives grips and hold the various textures/weight of the embellishments I love to use. I'm always secure in knowing that I can use as many embellishments/textures on my projects and they will hold their place. So go and pull out your metal, wooden, plastic and paper embellishments and I'll show you how I created this LO. To start, I used a mask, mediums, inks, embossing powder, etc to create a background on my patterned paper. Once you've achieved the desired background, now it's time to start adhering your layers. I used Helmar 450 Quick Dry adhesive. By using the 450 Quick Dry adhesive, it gives me enough time to adjust the layers before it set. Also, I don't add adhesive directly to the edges of my paper, just in case I need to tuck items under an already adhered piece. Because I pre-lay my components, I know where I need to add more height due to layers beneath each item. Here I only needed to add three 1/2" Square Zapdots due to where the picture would be positioned. Being that the center and bottom left corner of my picture will sit higher due to a previous layer, I only needed to add spots of liquid adhesive to secure. To secure my thread, I added a spot of 450 Quick Dry adhesive then added Zapdots to one side of my metal embellishment. The metal embellishment will layer right above the thread and both will be secured to position. And after adhering a few more embellishments here and there, here's the final result of my LO. I hope you enjoyed watching my process as much as I enjoyed creating it. Thank you so much for stopping by and creatively enjoy the remainder of your week. Hi everyone, Katie here! I have a garden in my backyard full of Summer vegetable plants! My two absolute favorite vegetables are banana peppers and cucumbers. You can't just buy banana peppers at the store, and cucumbers are always better fresh from the garden. I used a couple of photos of my favorite veggies on this layout. I had some cute vegetable diecuts that a friend had given me and I really wanted to make them stand out. So, I grabbed my stash of Helmar's 3D Zapdots! The extra dimension that the zapdots gave my diecuts are just what my layout needed. I especially love the little peppers in the mason jar! Using Zapdots is really simple- Just peel off one side of the backing and stick it to the back of your embellishment, then peel off the other side and stick it down! Easy peasy! I also popped up my basket of vegetables and the sun diecut. For adhering down the rest of my papers and layers I used my Quickfix adhesive runner. Helmar Supplies- Quickfix Adhesive Runner, Zapdots White Round 1/4"
Hi Helmar Fans! 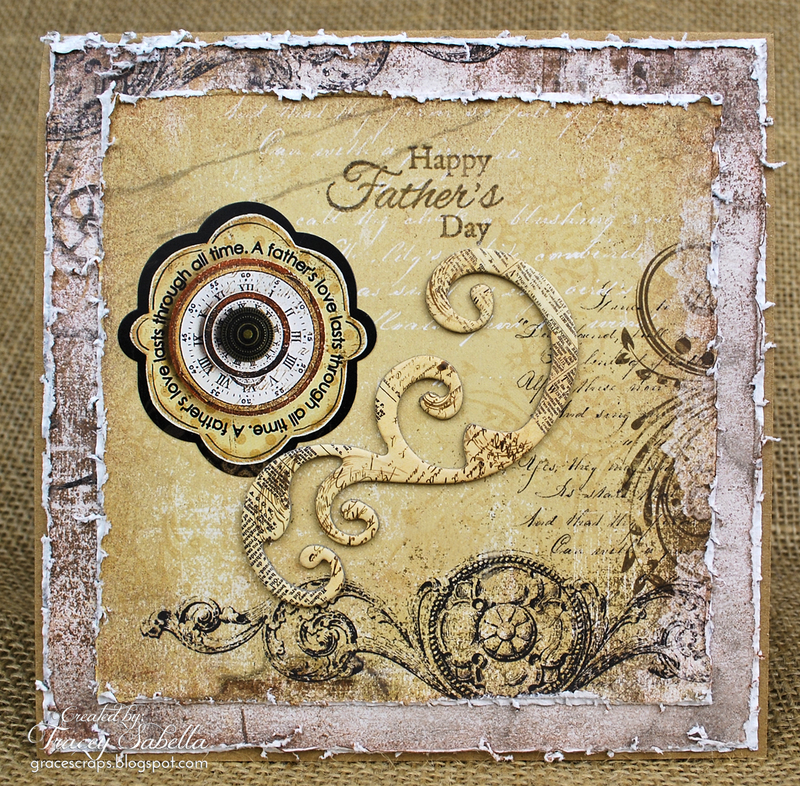 Cathy hosting the blog today, I have a fun and easy project to share with you for Father's Day! I made these fun beer coasters for my hubby to have downstairs in his space. Not really a man cave, but it does have his big screen tv, favorite leather couch and room reserved for his someday pool table and bar. The coasters are so easy and they go together in a matter of minutes. It is just the drying time that takes time. Here they are finished, I just have to stack them and wrap them with a little twine for Father's Day. First, you need to find four different six pack holders and you could use soda boxes to create these too. I saved a couple of my husband's favorite beer holders without him knowing and the other two I got at our local liquor store. They sell single bottles of beer that you can mix to create your own six pack and they always have extra holders in the cooler for those. I just asked the guy if he minded if I took a couple and he told me to help myself....helps that his mom is a scrapbook buddy of mine. I purchased marble tiles at my local hardware store. You get 8 in a pack so you could make 2 sets of coasters. You need Helmar's Decoupage Paste, a foam brush your cut cardboard pieces and felt self adhesvive pads for the bottom of your coasters. I simply traced the coaster over the cardboard design that I wanted to use. I used my paper trimmer to get a nice clean cut. Next, add a medium thick layer of decoupage paste to the tiles and adhere the cardboard design. After you have all of your designs on, flip your coaster over and weight them down with something heavy so they dry nice and flat. I used some soda bottles to weight them down and I let them dry over night. The next morning I took the coasters outside and sprayed them with Helmar's Crystal Kote Matte Spray. I did two light layers of spray, giving them about 5 minutes of drying time in between coats. The matte spray seals the cardboard and gives them a nice water repellant coating. Finish your coasters with self adhesive felt pads on the bottom, this protects your furniture from getting scratched. I just put one felt pad in each corner. That's it, your done and how easy was that?! I recently picked up a few bare lampshades from my local secondhand shop and decided that one of the more 'modern' styles would be perfect for my daughter's room. She likes 'Shabby Chic Style' and so pink and white were the chosen colours. Firstly I used some laces which were cut from an old top and old wedding dress (also from the secondhand shop), small offcuts were all that were needed together with Helmar 450 Quick Dry Adhesive and any trims and decorations that you like. Using your Helmar 450 Quick Dry Adhesive, run a bead of glue all around one section of the frame, my frame has four sections so I will be alternating the laces. Place a piece of the lace over the glued panel and once you feel it 'grab' then you can stretch the lace nice and tight, this does not take long and this is the first lampshade I've covered without the need for some type of clamp to hold the fabric. Helmar 450 Quick Dry Adhesive really lives up to it's name on this project. Allow to dry (won't take long) and then trim the lace close to the metal frame. Continue around the whole lampshade in the same way, remembering to trim each panel as you go around. Once this is done, run a little more glue on the inside bottom and top frames to wrap your lace around. Once each panel has been covered, glue your trim of choice to the metal frame. And then attach a pretty fringe or fancy lace to the base of the shade. A vintage lace bow on each join finishes off the lampshade. All I need now is to find a nice tall slim lamp base and it will be complete.